During the the Second World War the Royal Observer Corp (ROC) played a key part in the war effort by spotting formations of enemy aircraft approaching the UK. During the Cold War this role was expanded. On the 15th June 1955 it was announced in the House of Commons that steps are being taken for the ROC to give warning of and to measure radioactivity in the event of air attacks in a future war. As a result of this over a 1000 underground observation posts were built enabling the ROC to observe the effects of nuclear weapons being detonated over the country. 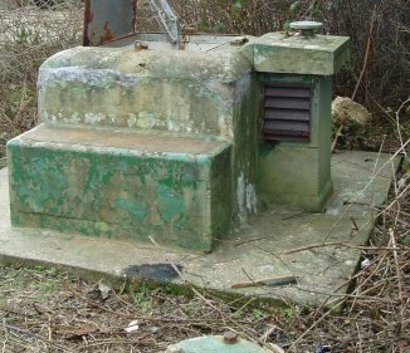 Towards the end of the 1960’s the bunkers were decommissioned, either being sold off, locked up or dismantled. However quite a few seemed to have been forgotten about including this one! It is now a forgotten relic of the Cold War and occasional den for local children! You have to go down into the bunker to find the cache, hence the high “terrain” score! All you will need is a torch and a sense of adventure! Please don’t park right next to the bunker. The track is a frequently used farm track. You might also draw attention to the bunker! There is room to pull in on the west side of the B4000. When you leave please check that you have closed the lid correctly and put the latches down on the lid. There is not much to find or see in the bunker, which is a shame but who in their right mind is going to pass up the chance to grab a cache like this whilst its still available? Be the first to comment on "Cold War Cache, Underground."